From the M62 leave at junction 36 and turn on to the A614 – signposted Rawcliffe, first left off the slip road roundabout. 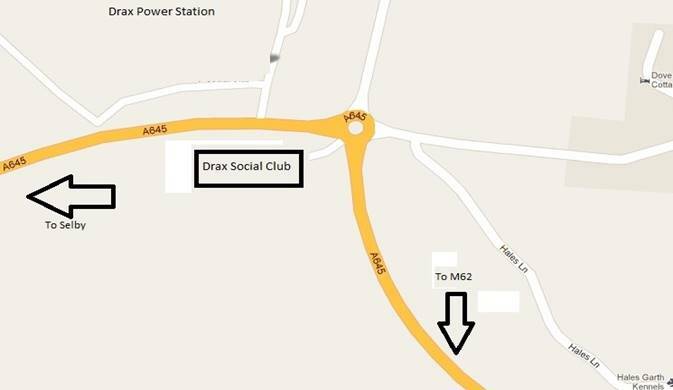 At the first road roundabout take the second exit on to the A645 - signposted Drax. At the next roundabout the entrance to the club is the first exit (not signposted but difficult to miss). You have a choice of remaining on the A1 and turning east towards Hull when you reach the M62 and then following the directions above. If you are relying on a SatNav it may well take you across the A64 east towards York and then south down the A19 towards Selby and around the bypass and onto the Bawtry road to Camblesforth where you should turn left to Drax. You have a choice of A1, M1, M18 or M180 to get you onto the M62 and then once more follow the instructions from junction 36. A SatNav may try to take you over the Humber Bridge as being slightly shorter in distance but it is only about 5 miles so it is NOT worth the toll! The postcode / input YO8 8 Drax appears to work satisfactorily with most SatNavs. This map shows the immediate road layout at the club.